Welcome to the blog and look for the stuff you want to know . . . . .
and many private exams too! This page has the links only for CEED/NID and UCEED. You can check the above links for the individual design exam links, which is basically the menu tabs. Solving geometric type of questions. Like I said in my other posts, Creativity and lateral thinking is one of the most important requirement for a designer as well as a design aspirant like you (especially those aiming for CEED and NID exams). Even if you happened to be astonishingly good at sketching, and if you don't have at least basic creative ideas, then it's a waste ! 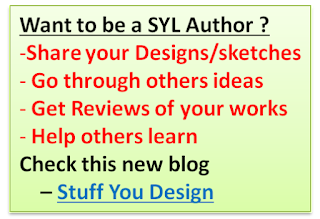 If you have any such works, you may send that to my mail or inform me about your works in Facebook; I will be including your work in this blog for others to look and learn.